Digital Government: Managing Public Sector Reform in the Digital Era presents a public management perspective on digital government and technology-enabled change in the public sector. It incorporates theoretical and empirical insights to provide students with a broader and deeper understanding of the complex and multidisciplinary nature of digital government initiatives, impacts, and implications. The rise of digital government and its increasingly integral role in many government processes and activities, including overseeing fundamental changes at various levels across government, means that it is no longer perceived as just a technology issue. 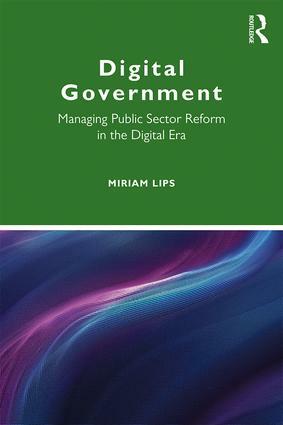 In this book Miriam Lips provides students with practical approaches and perspectives to better understand digital government. The text also explores emerging issues and barriers as well as strategies to more effectively manage digital government and technology-enabled change in the public sector. Digital Government is the ideal textbook for postgraduate students on courses in public administration, public management, public policy, political science and international relations and e-government. It is also suitable for Public Service managers who are experiencing the impact of digital technology and data in the public sector. Miriam Lips is Professor of Digital Government and Programme Director of the new e-Government Master’s programme at Victoria University of Wellington’s School of Government, New Zealand.